Our latest visualization maps out how much state and local tax the richest 1 percent of a state pays, compared to the poorest 20 percent of the state. The data comes from a report titled Who Pays: A Distributional Analysis of the Tax Systems in All Fifty States. The report, released by the Institute on Taxation and Economic Policy (ITEP), analyzes state and local tax rates paid by all income groups to determine the fairness of each state’s tax policies. According to the ITEP report, the lowest-income 20 percent of taxpayers end up paying, on average, a state and local tax rate more than 50 percent higher than the top 1 percent of households. ITEP states that nationwide, the average effective state and local tax rate is 11.4 percent for the lowest-income 20 percent taxpayers and 7.4 percent for the top 1 percent. However, these effective tax rates vary significantly from state to state, based on whether the state’s tax structure is characterized as “regressive” or “progressive.” In a regressive tax system, the average tax rate decreases as the taxable income increases. Conversely, a progressive tax system has taxpayers pay a higher tax rate as they make more money. The gap between how much the poor pay compared to the rich is wider with more regressive tax systems. Interestingly, seven of these states (Washington, Florida, Texas, South Dakota, Nevada, Tennessee, and Wyoming) are among those that don’t levy a state income tax. The ITEP report posits that the lack of a personal income tax in these states leads to an overreliance on local sales and excise taxes, which therefore shifts more of the tax burden to the poor. Here’s an example. Suppose a loaf of bread in Texas comes with a sales tax of $1. For someone making $100, that $1 in sales tax equates to 1 percent of their income, while for someone making $1,000, it equates to 0.1 percent of their income. Without a progressive personal income tax that has the wealthier person pay more to the government, the poorer person is stuck with the higher tax burden as a percentage of their income. States with more progressive tax systems have higher marginal tax rates for higher-income households. ITEP reports that these states collect, on average, more than one-third of their tax revenue from income taxes (compared to the national average of 27 percent of state revenue from income taxes). States in the Northeast tend to have the most progressive tax structures in the country, while those in the West and South have the most regressive structures. As the gap between rich and poor widens, taxes will remain a hot-button political issue. 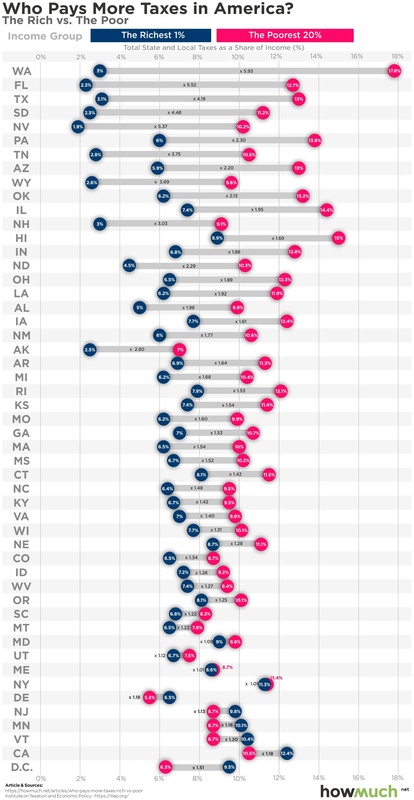 Want to learn more about income inequality by state? Here’s that visualization, too.